Internet has been flooded with the news of the hottest May month ever recorded on Earth after the release of Global Surface Temperature Anomaly data by NASA’s Goddard Institute for Space Studies (NASA GISS) on June 17. 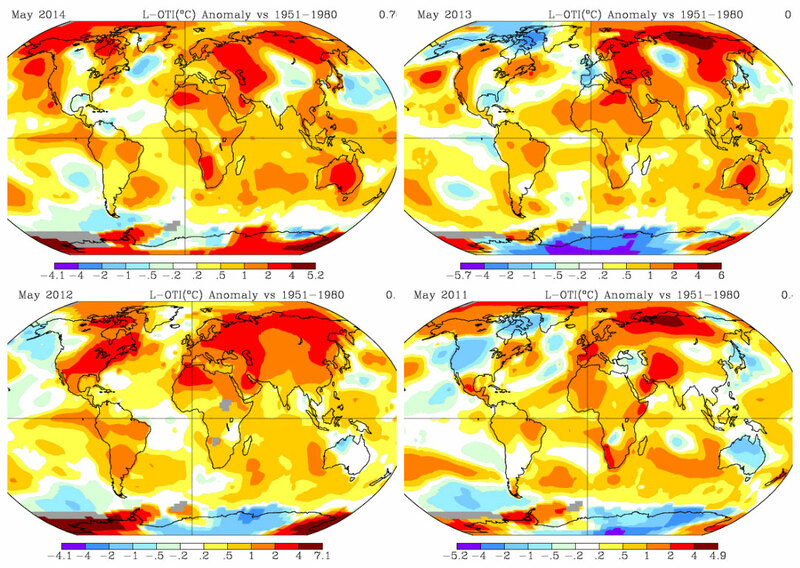 The surface temperature anomaly recorded in May 2014 was 0.76°C when compared over a base period of 1951-1980. This surface temperature data comes from the observatories placed on the land for recording the surface air temperatures across the globe and on some ships and buoys (floating weather stations) in the oceans which record the sea surface temperatures. This temperature data is combined and compared with the temperatures taken during 1951-1980 and anomalies are calculated on a regular basis. The 0.76°C anomaly of May 2014 tops the list of surface temperature anomalies of May taken from the year 1880 and hence has been a trending topic on Internet. As the temperature anomalies have been calculated using a base period of 1951-1980, a significant rise in the temperature (positive anomaly) is being seen from 1980 and has increased further in the last two decades. Since 1995, all the surface temperature anomalies have been positive only, indicating that the surface temperatures have remained above normal. These surface temperature anomalies have been averaged on a macroscopic level or global level and, hence, considering microscopic anomalies also become important. This means that in May this year, an anomaly of 0.76°C was recorded globally but it wasn't that the temperature anomaly in India was also 0.76°C. 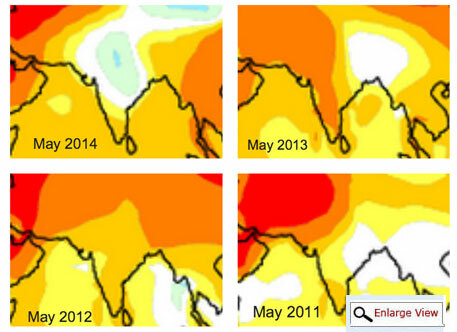 In fact, the temperature anomaly in India in May was a complicated one. In Kerala, Karnataka and Tamil Nadu, a temperature anomaly of 0.5°C to 1°C was seen, whereas in Western Maharashtra and Telangana a temperature anomaly of 0.2°C to 0.5°C was seen. Interestingly some parts of Maharashtra, north and central India had almost normal temperatures but some parts like Vidarbha showed cooling and hence the temperature anomaly of -0.2 to -0.5°C (cooler than normal) was witnessed. Further, a temperature anomaly of about 1°C was seen in east and north-east India. The scenario was a contrast in May 2013 when the global surface temperature anomaly was 0.55°C, which was less than that of May 2014. 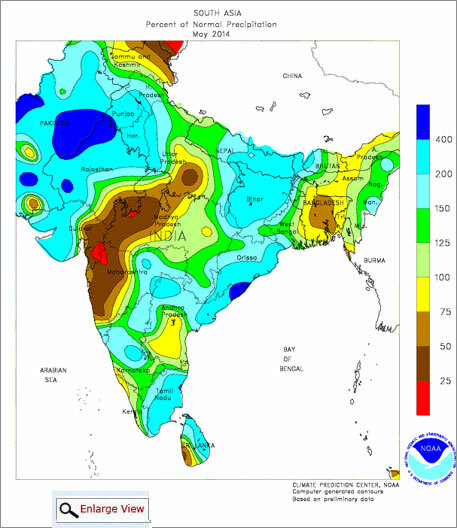 The temperature anomaly in India was higher than that of May 2014 for western half of India whereas eastern and north-eastern areas witnessed a normal May month and hence a total contrast to May 2014. May month kicked off with thunderstorms and rains in southern and central India due to which temperatures did not rise significantly. Then a low pressure system from the Bay of Bengal travelled towards the Arabian Sea through southern India and due to its influence, cloudy weather and rains were witnessed in southern and central India around May 10. Meanwhile, western disturbances kept hitting north India, especially Jammu and Kashmir (J&K). Climate Prediction Centre (CPC) of NOAA in the US issues monthly recorded anomalies (like temperature, precipitation) for India. As per CPC, many areas of India received more than 100 per cent (of normal) rainfall in May. Exceptions to this were western Maharashtra,western Madhya Pradesh, eastern Gujarat and eastern J&K where rainfall was less than 75 per cent of the normal. Hence frequent cloudy weather and rains in many parts of India kept significant heating away in the remaining parts of May, and overall India experienced a cooler May month. Dealing with climate change in recent times has been a big challenge for governments and meteorologists. Figuring out at what rate the climate is changing is a big challenge as there are no clear trends at a regional level, especially when we consider data like temperature anomaly on yearly basis. On averaging over an interval of some years, say a decade, we get some figure of average rise in temperature but it doesn’t work that well when compared with the individual years. Hence choosing the proper interval becomes very important when dealing with the climate change issues. In the two decades from 1994-2014, surface temperature anomaly in May for Central India was between 0.2°C to 0.5°C. However, a contrast was seen in May 2014 when central India cooled by 0.2°C to 0.5°C instead of warming. This is why it becomes difficult to link such anomalies with climate change on yearly basis. Although the global surface temperature anomalies have been positive since many years, there have been variations from country to country and even from state to state over the period, making it challenging to determine exactly how much the temperatures will be rising in the coming years in any particular region in any particular period. 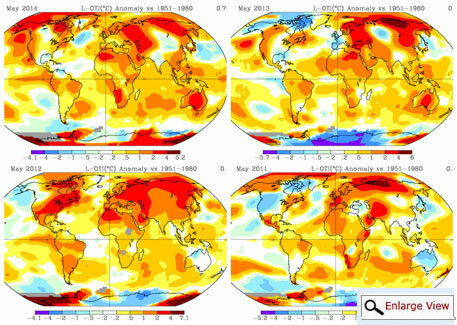 A comparative study of surface temperature anomalies of May 2014, 2013, 2012 and 2011 will give an idea of this. We can see that even the anomalies are varying every year which can be inferred from the colour shade over India (see image below). Dark orange or red indicates a temperature anomaly of 1°C to 4°C whereas white represents no anomaly. Hence there is no clear trend region-wise which can be used for framing policies to deal with climate change on a global and even on a national level. Hence, there is a strong need to monitor the changes happening on regional levels in India and, accordingly, frame the policies to deal with climate change which will focus the states/regions more than India as a whole.